End of the year deals are available now! 2016 is fast approaching, and WorldStream is happy to announce we are providing end of the year deals as an extra introduction. Check us out at www.worldstream.nl as our available servers have an applied discount of 20%. Next to our already familiar servers, we are proud to announce a new brand that has been submitted to our inventory. 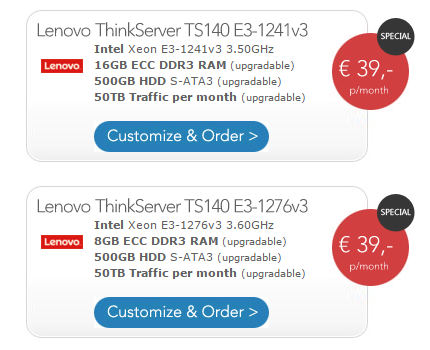 We have introduced the Lenovo ThinkServer® product line to our stock. We are offering the same quality support, hardware and services to our customers, to ensure you receive the best solution for the demands and services you require. WorldStream is now providing two new quality builds. The E3-1241v3 and E3-1276v3 make their introduction into the WorldStream merchandise and are ready to be put to the test!